Will Hutchins on Audrey Hepburn; Robert Horton; Neil Summers and memories from all the "Sugarfoot" stills he send. forever. I met her loveliness back in the ‘50s at Col. Warner’s Honor Ranch. She cuddled a poodle in her arms—lucky dog! Audrey smiled, said hello. That’s all there was. I floated on air. Suddenly, I became a much nicer guy. I gave my hoss Penny extra carrots. I doffed my Stetson in grain elevators. I helped girl scouts cross the street. After two weeks I returned to earth. Before Audrey there was Gene—Tierney, not Autry. I hated Oleg Cassini when she chose to marry him. Couldn’t she have waited til I got out of Junior High? Listen! It’s her laugh that floats on a summer night, her footsteps I hear down the hall, her face in the misty light. Before Gene there was Phyllis Welch. She hit the happy highway with Harold Lloyd in the road comedy “Professor Beware”. I was a little feller. I wanted to cry out, “Hey, wait for me! I’ll get my beanie and go with you!” She kept on movin’ down the road. She vanished beyond the horizon. 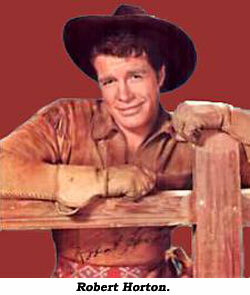 of “Wagon Train”’s Flint McCullough Fan Club. Stacks of vintage movie magazines featuring guess who cluttered our house (until they mysteriously disappeared). There’s a framed photo of Bob astride his faithful steed Stormy Night in our living room. Upstairs in Babs’ childhood bedroom rests a life-sized pasteboard cut-out of (yep) Sweet ol’ Bob—Dogies! If it weren’t for the lovely and talented Mrs. Robert Horton, Marilynn, I’d most likely be livin’ in a big cardboard box ‘neath a bridge in beautiful downtown Palookaville, USA. Listen! THWACK—A package lands on our porch. From the unfathomably generous Neil Summers, it contains still pictures from my TV cowboy heyday, re-kindling fond memories. THWACK—another package. Our mailman’s arm is more accurate than our paperboy’s. Where Neil digs up this bottomless treasure trove of 8x10s beats me—he won’t take my happy lettuce. OK, never argue with stunt folks. So blamed many! Where’d I find time to pose for ‘em? Didn’t I ever just lounge in my canvas chair (with the sugar cube and boot on back), sippin’ mocha Java, learnin’ lines, chattin’-up the ladies, nappin’? What about lunch and port-a-potty breaks? What went on? Non-stop monkey faces for those F-stop hombres with their speed-graphics and Leicas? “Just one more,” they’d say, makin’ us come up with authentic smiles when they told us feelthy jokes. Lookee here at this dandy. The ever lovely Nina Shipman on horseback with some whippersnapper, young enough to be my grandson—ouch! It’s me. The years run away like wild horses. Nina looks born to the saddle. Great gal. She played a photographer (of all things) in an epic titled “Shadow Catcher”. Her dad Barry Shipman and our wonderful director Pete Adreon helped create some of Republic’s most rousing cliffhangers. Jason Robards Sr. played an Indian chief, his first gig in 12 years. He’d gone blind and refused an operation because of his religious beliefs. Then, one day he regained his vision—he saw the light! After 12 years he agreed to an operation. THWACK. More oldies but goodies from good ol’ Neil. Here’s a famous puppy. 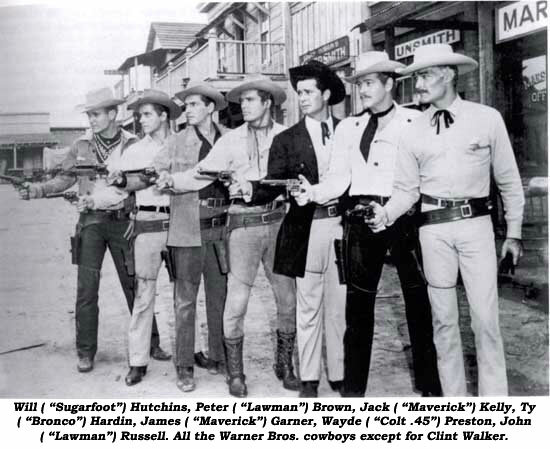 From left to right, all in a row, guns drawn, lookin’ mighty grim: Hutch, Pete Brown, Jack Kelly, Ty Hardeen the Turkish cowboy, Jim Garner, Wayde Preston, John Russell—dangerous dudes ready for action on the now defunct WB western street. (Ain’t progress grand? One step forward, two steps backward). Wow! Who’s the cute Cherokee maiden playin’ kissie face with me? Why, she’s Grace Raynor, fresh from a theatrical engagement with Tallulah Bankhead. Grace was wild and woolly—Me too! Honk! Never once did I catch sight of her in civvies without dark make-up and black pigtailed wig. Word was out she was a blonde. The show was an adaptation of a south seas story by Robert Louis Stevenson. Strictly fun time working with Grace and John Carradine. He was a script girl’s dream. He was a master at matching his actions from shot-to-shot in a scene. One day Jacques Tati visited our set. I was too awe-struck to say Howdy to the great French screen comic. Instead, I tossed a handful of trading post dried beans high in the air. They landed on our director Lee ‘Rollem’ Sholem’s head. Lee angrily looked up at a grip on a catwalk and yelled, “Cut it out!” That one was for you, Monsieur Hulot. Jimmy Stewart once declared he fell in love with all of his leading ladies. I believe it. He was that great an actor, delving deep into his characters’ souls. Me? I was a mite shy. I tended more toward secret crushes. I didn’t need makeup. I blushed a lot. Here they all are, one more time, a passing paper parade of pretties from my past, my gal pals o’ the saddle—Diane McBain, Merry Anders, Luana Anders (no relation), Fay Spain, Madlyn Rhue, Olive Sturgess, Erin O’Brien, Dan Blocker (how’d he get in there? ), Lori Nelson, Judy Nugent, Janet Lake, Jan Chaney, Mari Blanchard, Lisa Gaye, Judy Dan, Cathy O’Donnell—what devine deputies, damsels in denim! Which picture is my favorite? Let’s see—Ah! Here! Yeah! Anita Gordon and I lockin’ lips. Remember her as the little girl singer on the Bergen-McCarthy radio show? Her hit records with Buddy Clark? Anita Gordon. On our episode, “Hideout”, she loved another. On the outside world she was hitched. Never saw her again—except for our picture. Thanks, Neil.